“Imagine if hundreds of talented younger female and male directors had a term with an ASX 300 listed company or large private or not-for-profit enterprise and worked side by side with Australia’s top directors. The country’s pool of next-generation directors would be transformed”. He understood that boards play an integral role in the success of any organisation and that just as business needs diversity of talent so do boards. Like the Governor General we want to lead a debate about creating diversity on boards. 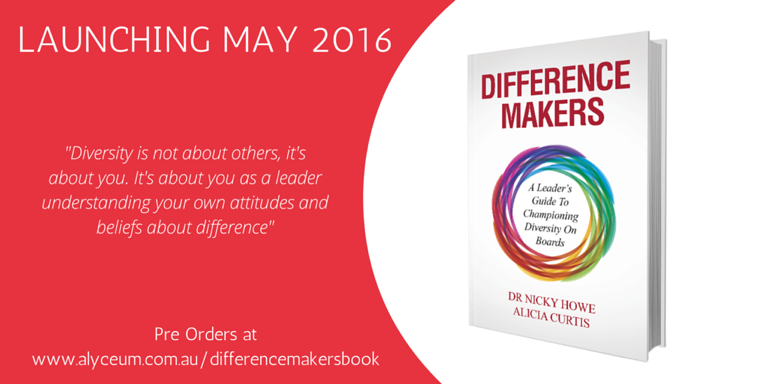 Our latest book Difference Makers: A Leader’s Guide to Championing Diversity on Boards seeks to help you join us in challenging the current thinking about who has the ‘right stuff’ to sit on boards. 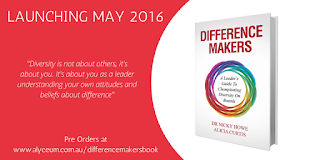 Difference Makers provides readers with the latest insights into how traditional approaches to securing directors who are reliable, like-minded and known entities is not enough in this volatile, complex, ambiguous and uncertain (VUCA) world and neither is a narrow interpretation of a directors role. There are increasing reputational, legal and compliance risks, and an increasing number of stakeholders who are scrutinising the actions of boards and speaking out when they don’t like what they see. This higher-stakes environment is increasingly putting board composition in the spotlight. We only have to remember cases like Enron and James Hardy to realise that board culture and ethics are key characteristics of effective board governance. Boards continue to face ever-expanding agendas, uncertain market conditions, legislative changes, funding cuts, rapid technology changes and the challenge of complying with regulations in more and more jurisdictions where their organisations want to do business. An evolution is under way, and boards now are beginning to realise that it is the breadth of perspective, not the mere inclusion of various diverse traits, that benefits the organisation. Not only are directors’ professional skills and expertise coming under more scrutiny but so too is the mix of ages, gender and ethnicity of board directors. In building the business case for board diversity, Difference Makers highlights the national and international research. Board members from a range of sectors offer their insights about board diversity and facts and statistics are used to demonstrate the financial, cultural, customer, reputational and innovation benefits that are improved through board director diversity. Difference Makers re-frames the debate about who can participate in a board directorship so that differences are not seen as negatives but as positives. Dr Nicky Howe and Alicia Curtis share their experience and research on how different points of view and different experiences can enhance problem-solving and spark innovation; it can build better boards and ultimately better organisations. Yes, i agree that the boards play an important role in the progress of any ogranization. You posted some of the best points from this book. After reading this, i will try to get and read all the book. Cheers! !